This style director chair is easy foldable and portable to take out. Sturdy aluminum frame and 600D polyester embossed fabric makes it very sturdy and portable. Maximum Loading capacity of this chair is up to 600lbs. Side table design with cup holder can bring to a perfect summer outdoor or indoor leisure with a cup of drink you like. This side table can also be folded. Padded armrest provide you comfortable experience when sit on it. It is your best choice to take it out for outdoor activity with it foldable and lightweight design. Timber Ridge is a professional outdoor brand which devotes to provide best outdoor experience for customers. 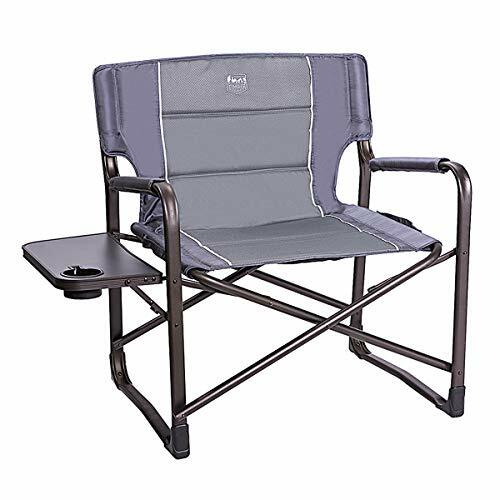 Our products cover different fields on outdoor activities including wagons,zero gravity chair,folding chairs,tents, etc. All the products are subject to multiple strict quality tests on different extreme environments before entering market. We have reasons to believe our quality products will meet all the needs on outdoor activities.